This project was designed as a pan-Wales assessment of prehistoric defended enclosures. In north-west Wales this was designed to be carried out over two seasons of work and comprised about 120 known prehistoric defended enclosures of which 61 were Scheduled Ancient Monuments. Only one in four of the latter were to be visited because these are already well-known and protected monuments. The first year was in west Conwy, north Gwynedd (Arfon District) and Anglesey and was completed in March 2005. The second year, 2005-6, comprised visits to sites in west Gwynedd (Dwyfor District) and Meirionnydd. There were about 72 known sites of this type in west Gwynedd and Meirionnydd, of which about 48 were visited. Thirty-three are scheduled ancient monuments and 15 more sites were identified as possibly of national importance. Several of the sites were possible enclosures identified from aerial survey in recent years and which had not been visited to assess them on the ground. New features were recorded at some of the known sites and one new site was identified by chance, during the survey. This is a small promontory fort on the southern slope of Moel Faner, north of Dolgellau where a substantial bank defends the uphill side of a hill-slope promontory. 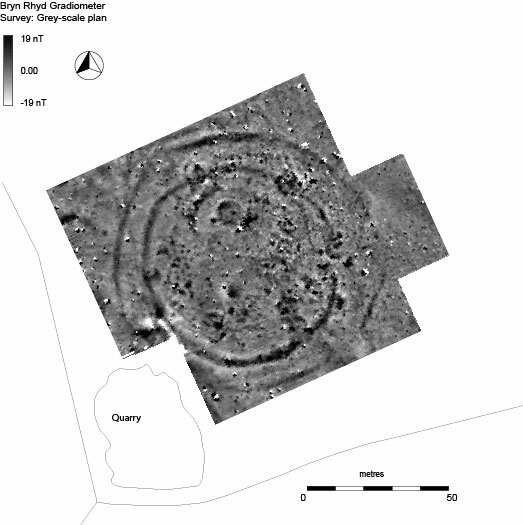 Trial geophysical survey was also carried out at two sites in 2004 with David Hopewell and this was very successful. Two further sites were surveyed in 2005. One was a small, well-defended promontory fort at Byrllysg, Llanbedr, Meirionnydd, a scheduled site. The other was a large hillfort site at Cefn Coch, Maenan, Conwy known only as a crop-mark on an aerial photograph. Unfortunately both the surveys proved to unproductive. Byrllysg had a stone defensive bank and the interior would presumably originally have had stone-built huts that must have been cleared for agriculture. The interior was surveyed but produced only random geological anomalies and the lack of useful results was taken to be because of the rocky nature of the subsoil. At Cefn Coch, a field of well-ploughed pasture, where there was clearly a deeper soil over soft subsoil, good results were expected and an area of the interior and of the bivallate defences were surveyed. However, no possible archaeological anomalies were recorded, even of the defensive ditches. This was taken to be because the silty subsoil was so similar to topsoil that they had no geomagnetic contrast.